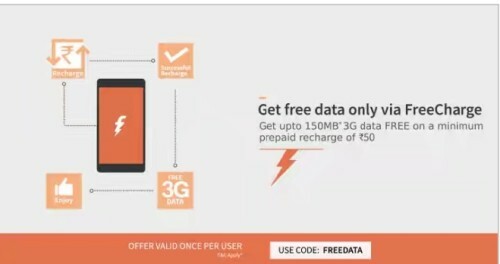 Freecharge FREEDATA Free Recharge – Now get 150 MB 3G Internet data for free on recharge & bill payment at Freecharge. Yes it’s true now Freecharge is offering free 3G 150 MB data on Rs 100 or more mobile recharge & bill payment. Offer is valid for all operators like – BSNL, Idea, Docomo, Vodafone & more. 4) FREEDATA promo code has to applied to avail the offer. 5) Valid only once per user per debit/credit card. 6) Free Internet data will be automatically credited within 30 minutes. 7) Offer valid on minimum of Rs 100 recharge. 8) Not applicable on transaction done via Freecharge balance & net banking. 9) Freecharge reserves the right to modify for withdraw the promotion at any point of time. Tags – Freecharge FREEDATA, Freecharge Free 3G Data Offer, Free Recharge Tricks, Recharge Tricks, Free Recharge, Cashback Coupons, Cashback Offers, Promo Codes.